Before becoming lead singer in the fabulous Scissor Sisters, Jake Shears was Jason Sellards, just a kid with an unfathomable imagination and a love of He-Man dolls. Splitting life between Arizona and the Pacific West Coast, his childhood was marked by school bullies and the terror of the rise and misunderstanding surrounding the AIDS virus. 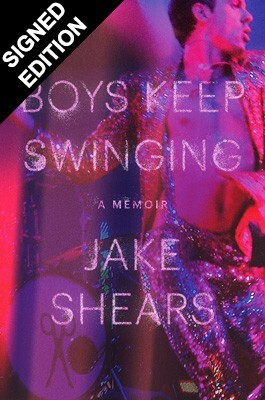 With changes in age and geography Shears gradually found a sense of belonging - first in Seattle, then in the street life and lights of New York City in the late 90s where, with friends and musicians also thirsting for freedom and the stage, he would form Scissor Sisters and go on to sell out venues worldwide. This is a wide-eyed and determined coming-of-age story from a world famous LGBTQ+ icon, but its heartbeat is Shears' friendship with Mary Hanlon, who he met via The Edge, a prehistoric chatroom, when he was 15 and she was 21. For years Shears lived in New York with a landline for which only Mary knew the number. Although long-distance, self-absorption and changing circumstances would take their toll on the friendship, this was the safe-house that sheltered a pair of misfits from the unthinking prejudices of a fearful world, a haven to which both would always return, and for which Shears wrote the song 'Mary'. What an absolutely phenomenal memoir, I was captivated from the very first chapter. A brutally honest and extremely raw, honest and addictive read.